I often think about my own funeral. As morbid as that may be, I have the whole thing planned out. I want people to bawl their eyes out and dive in the casket. (A former student, LB, has already called that role.) I want the saddest songs played, and I want it to be standing room only, even if the people in the room had to be compelled to come. I’m totally teasing about this funeral of course. My main desire is really that people give their hearts to Jesus there. Why? I want to leave a legacy that people will miss when I’m gone. I want to finish well. To accomplish this is to start in one direction that is God-ordained and to end up there, despite obstacles, with fruit to show for it. That’s why it was so hard for me to leave my teaching job after eleven years. I left feeling like a failure. Two of my favorite movies are Mr. Holland’s Opus and Sister Act II, probably because the teachers in both persevere against seemingly-impossible odds. They affect their students beyond the sphere of the classroom and help them rise to meet school challenges as well. In my class, on the other hand, I usually had the highest failure rate. Though I loved my students and prayed for them daily, I was told that I was “leading the league on parent complaints.” And though I always looked forward to the last day of school when I would sing “I Hope You Dance” (yes, it’s cheesy!) for each of my classes with tears, the behavior in one class last year was so bad that I couldn’t muster up the good will necessary to sing them my best wishes. 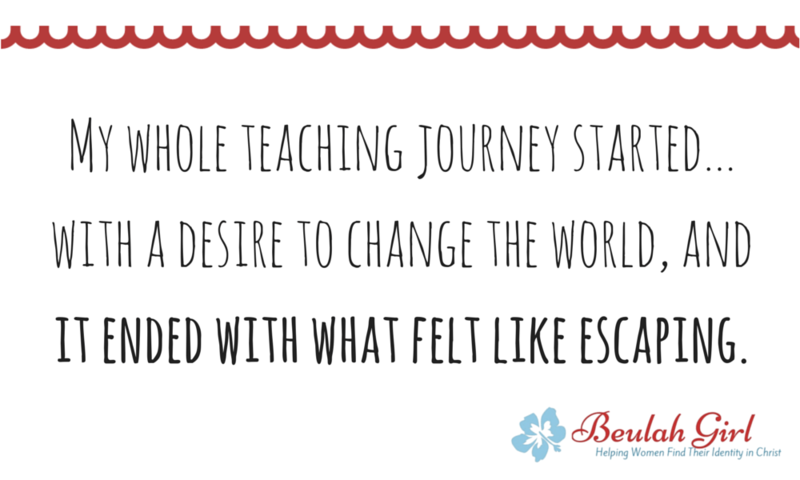 My whole teaching journey started, like that of so many others, with a desire to change the world, and it ended with what felt like escaping to another job instead. In my mind, I did not finish well. In the book of I Samuel, Saul was a perfect example of someone who started very well and finished, um, not so well at all. When God’s people didn’t trust Him enough to be their king, they asked for another. And what they got, from the outside, looked like the perfect fit. He was tall and handsome, the obvious choice. In spite of his attractive physical traits, he still was humble, a beneficial combination to start a rulership. That humility was what caused him to hide among the baggage when it was time for him to be anointed, because he was scared to death and certainly not seeking any kind of attention (1 Samuel 10:22-23). Saul not only started humble, but he started holy. After he was anointed king in private, he was given the power to prophesy with some prophets on the road. Once he became king, he warred for God’s name, adding bravery to his strong start. His men followed him, and they won the victory time after time. Saul seemed to have such a strong start, but a start means nothing if the finish is weak. Three examples from his life might show us how NOT to fall into the same trap. 1. We must stay focused on whom we’re following. Samuel was the one who poured out his heart and his oil to anoint Saul king. Thus, Saul should have been following this spiritual father. But one day when Saul grew impatient waiting for Samuel to offer the priestly fire in battle, he kindled it himself and lost the Lord’s anointing hand in the self-same moment. In this New Testament life, we are following Jesus as our great high priest (Hebrews 7:15-17). Should we then try to take the reins from Him? If we are to finish well, I think that following the one who knows the way is a much wiser decision. 2. We must let God be our defense in trouble. As the bitterness of Saul’s lost anointing grew in his heart, the forsaken king even turned his back on his son’s best friend David, his rival to the throne. There was probably no way that Saul could have reversed God’s decision on choosing another, but did he have to focus on revenge and hatred? Couldn’t he have run to his Father for help in living the rest of his days well? We read this story and judge Saul, but we also try to defend ourselves and get revenge, even if in our thoughts. Instead, we have to do what the old song says and begin “learning to lean on Jesus.” Psalm 46 calls him our “very present help in trouble” and a “fortress of strength.” He knows how crazy and full of sin this world is, and He’s the only one who, in us, can help us finish well despite the trouble around us. 3. We must remember that someone else’s abundance is not our lack. Jealousy robs us all of peace, and such jealousy had the same effect on Saul. When torments came on him, a young harp player named David was able to soothe them with his playing. If Saul could have accepted the peace of a gentle musician, his life wouldn’t have been in torment. However, once David was called to strip Saul’s kingdom from him, envy blinded Saul to any possible peace. God had enough to give both Saul and David blessed lives, but Saul couldn’t see that. 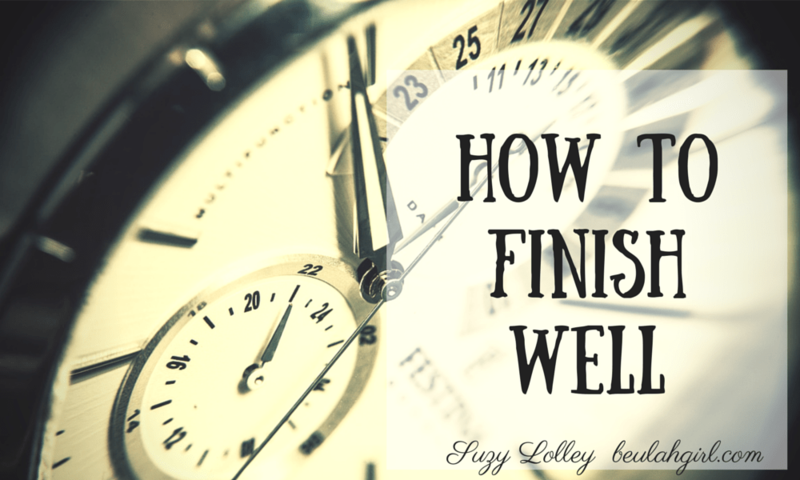 If we are to finish well, we can’t run someone else’s race. That’s why I want to follow Paul’s example and run hard, getting back up when I fall, and crossing the finish line to hear my Jesus say the most precious words I’ll ever hear: “His lord said to him, ‘Well done, good and faithful servant; you have been faithful over a few things, I will make you ruler over many things. Enter into the joy of your lord’ “(Matthew 25:23 — NKJV). Remember that I said I did not finish my teaching journey well? I think that’s only partially true. When I moved from one high school to another, I received emails from a handful of students to tell me that they missed me, that they remembered my birthday, or that I had secretly been their favorite teacher. Another student that I taught in eighth grade ran into me in the Dollar Tree and called his friend over to tell her that I had changed his life. Yet another introduced me to his wife and daughter (I’m old!) and apologized for his behavior in my class. However, there were many days that I walked the halls of a public school and was just like Saul. I lost my focus on the largest mission field I could have possibly had at a job. I cried and called my husband to tell him I was quitting on the spot instead of running to the strong tower of my Savior. And I looked at other teachers, who seemed to have the love of the students and the good grades, with doubt that God could ever use me the same way. I was a Saul, and that convoluted my race and made my finish line seem impossible. Will God resurrect my teaching career? Will hundreds of students attend my funeral? I don’t know, but I do know that whatever I do from here on out, it has to be led by God if I am to accomplish His purpose. And He will accomplish it, because this verse is true: “For the which cause I also suffer these things: nevertheless I am not ashamed: for I know whom I have believed, and am persuaded that he is able to keep that which I have committed unto him against that day” (2 Timothy 1:12 — NKJV). My teaching journey is not over because my legacy has been planted in the more than one thousand students that I taught, and those seeds just might germinate after all. He will keep us, Friend, and everything we commit to Him. Let’s run the race so that we will win the crown of life He has stored up for us (James 1:12). Would you be bold enough to leave a comment here and ask us to pray for you if you’re struggling to finish well? We are here to help each other up, so don’t stay down a moment longer. Wow! “We must remember that someone else’s abundance is not our lack.”. SO powerful. I appreciate how frank you are in this post about your seasons of struggle. Makes me, as a reader, feel much less “alone” when reflecting on my own. Adriana, when a writer as talented as you pulls out a specific line and “wows” it, I feel good about it:) Thanks for the comment love.